Entry Ramp with a power assist door. Seating for 134 upholstered stacking chairs (theatre style) (Main floor capacity 112 with non fixed tables and chairs). The Auditorium is now newly equiped with an air conditioner/heat pump for your pleasure! Black removable stage curtains. Access from the “green room” and the main auditorium. The opening between the pony walls is approximately 15'9". “Green” room - holds an additional fridge with access to the nearby loading door. Bar- Fully stocked and licensed bar. 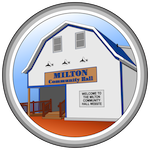 Bartenders are available from the Milton Community Hall upon rental of the bar. Sound System and Stage Lighting is available. Wireless internet is available in the facility. The second floor is accessed by stairs, and has 5 new dormers for light and airflow. The 2nd floor has a boardroom (13' 7" x 18 ' approx), Community Council office, two single washrooms, kitchenette and a large (33 ft x 18 ft) FCC Community Room. There is also a smaller meeting room (14'6" x 18') intended for senior activities and meetings. The board room, Community Council office and FCC Community Room are also air conditioned. Capacity has been set at 60 people, according to the fire marshal. The unfinished basement is used for storage. The hall is heated by low temperature propane, with auxiliary heating/cooling units in the auditorium and office space and FCC Room upstairs. There are also six ceiling fans in the main auditorium.